A series of recent news reports by the Karnataka state government’s Ramaswamy Committee has highlighted the capture of public land by politicians of all hues and their cronies in the form of land developers. One might have come across such land grabbing under high tension lines, too. I am a Koramangala resident and member/ex-secretary of the residents’ association of Koramangala 8th block. I want to recall my experience in this regard. The land lying below the 110 KVA HT transmission lines in Koramangala (behind Raheja Arcade) has been in contention for some years. The high tension line starts from Adugodi MUSS and extends to Ejipura passing through Koramangala 7 th ,8th, 5th and 6th blocks in that order. Such land under HT lines cannot be used for construction. Regulations prohibit permanent structures under high tension electrical lines. There are at least half a dozen areas coming under this HT line. The space below the line can well be used for parking purposes. In reality, it looks as if the BMP is not interested and the space seems to have been gifted to private parties to undertake construction activities. 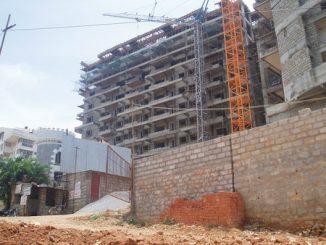 Private parties have flouted rules to build residential houses, swimming pools and brick walls under the Koramangala HT lines. It is also surprising that the KPTCL which has got the authority to inspect and object to construction under the HT lines is also keeping silent. It may be recalled here that a person died a couple of years back while cleaning a swimming pool constructed by a private club right under the HT lines. It was way back in late 2001 that I had proposed that the land be used for the parking of 4 wheelers in particular as they were eating into lot of space on the 80 feet road. I was surprised to be told by our then local corporator that he wanted to utilize the space for food court/stalls for the lower income working classes as Koramangala was filled with the more expensive classes of restaurants. His intentions not withstanding, I pointed out to him that no construction activities could come up below HT lines. But my suggestion did not have any effect. During his tenure he tried his best to construct a community hall in two areas coming directly under the HT lines. As it turned out, his efforts were thwarted by a vigilant group of local residents and residents’ associations. 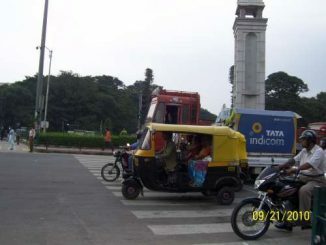 I had then raised the matter before BMP & BDA officials hoping that they would be able to do something. Even letters to the editors of forefront news papers had no result. It was only in November 2006 that the idea of developing the area behind Raheja Arcade for parking could get crystallized through the Koramangala Initiative; and that too after the official term of the aforementioned local politician came to an end! Come back to the present, the continuing lack of action from public officials has resulted in some residents becoming emboldened to do the illegal. For example, till recently, a local private organisation had merely blocked the area in 7th block Koramangala, near HDFC bank under the HT line with fencing and a gate. But, not stopping there, the same organisation has very recently raised a brick wall with a gate, replacing the fence and added some sort of structure under the HT line. In another case, an IT firm has installed a generator below the HT lines in 7th block. It is high time that officials act with alacrity and bring these areas under their control and to put them for better public use. If not another Ramaswamy committee has to be constituted to identify these areas in Bangalore city and to bring to book the erring officials! While vehicle owners complain of receiving baseless traffic violation notices, the city traffic police department claims negligible number of errors.